It is 46 years since Red Rum claimed the first of his three victories in the world’s most famous steeplechase - successfully defending his crown in 1974 before adding a third in 1977. Winning owner Michael O’Leary said: “It’s unbelievable. It’s a phenomenal training performance by Gordon. It’s brilliant that he keeps bringing this horse back at Cheltenham better than ever and Aintree better than ever. “And what a ride by Davy - fantastic. It’s unbelievable, to win two Grand Nationals is just incredible. However, Tiger Roll was always in their slipstream and it was clear on the run to the final fence that barring accidents he would seal victory, with Russell still motionless in the saddle. 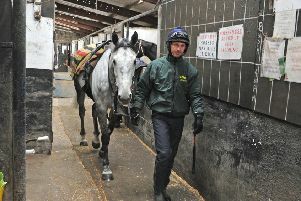 It was a third National success for Elliott - having first struck gold as a fledgling trainer with Silver Birch in 2007. 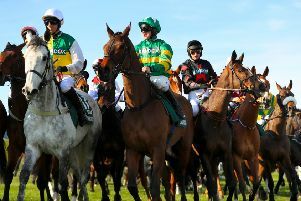 The County Meath handler - who had 11 of the 40 runners - said: “Winning this is special, I just can’t wait to get home to see all my family and friends. “I was trying to watch all of mine, I can’t believe it. “I never once thought he was going to win until he crossed the line, because I could remember was last year. He didn’t tie up this year. He’s an absolute gentleman to deal with. “I don’t get upset too often, but I’m emotional today. For my whole yard and everyone involved it’s unbelievable - you dream about this. Russell said: “He got very wound up before the race, which was unlike him. Then Denis O’Regan came towards me on another horse of Gordon’s and that was a big help. Once we got going, we were fine. “This horse and this place is amazing. People go on about certain sporting events, but Liverpool and Aintree are so far ahead. “People come here in the droves to cheer you on and they can be so proud of what they have here, it’s so well run. “Tommy Stack (who rode Red Rum in 1977) is a Tipperary man and I’m still in awe of him, because of this race. “Myself and Gordon go back a long way, my dad is here - he only booked his flight and hotel on Wednesday. It’s a marvellous day. She said: “He (Paddy Kennedy) said she did too much, she was running away the whole way. “It was just fantastic. I didn’t expect her to run that well. I wasn’t even going to bring her, Robert (Power) said to save her for the Irish National, at the fences would be too big. “All the way round I couldn’t believe how easily she was going, she was going so well - then I saw Tiger Roll on the inside, but she’s amazing. She went on: “Paddy rides out for me every morning, he has his own breaking and pre-training yard and had a big winner for me at Leopardstown this season. “When Robbie said he wanted to ride Jury Duty I said of course he could because she was nearly 100-1! “Tiger Roll is just amazing, he’s even better this year. He’s the most gorgeous little horse, and so accurate at his fences. Willie Mullins was equally proud of Rathvinden. He said: “Rathvinden ran a cracker, he had every chance, but he just wasn’t good enough. “Pleasant Company appeared to be going very well, but he unseated late on. Livelovelaugh ran well, but probably did too much too early. “I was trying to look behind Rathvinden to see who was going well, but I missed the winner. Mind, there were so many maroon colours (of Gigginstown House Stud) it was hard to know. I was just trying to concentrate on my own. “I was even trying to watch Patrick (Mullins, son), he got a great spin on the first circuit from Don Poli. There was a sad postscript to the race, however, as it was announced the Mullins-trained Up For Review had suffered a fatal injury when he came down at the first fence.